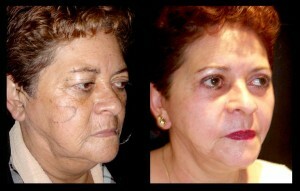 Although there are several techniques to correct aging changes, the most outstanding technique is AmayaPeel®. 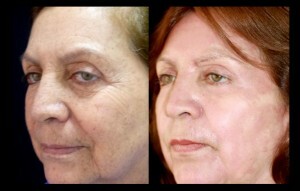 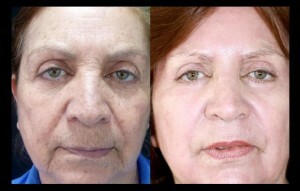 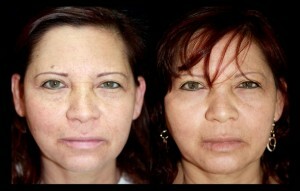 A non-surgical procedure that produces real rejuvenation, for up to 20 years, in only 12 days. 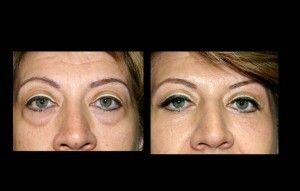 For moderate cases, we use little invasive techniques, such as micro fat grafts, dermabrasion, laser treatments, facial fillers, and Botox® complemented, in some cases, with eye lids, nose, and chin surgery. 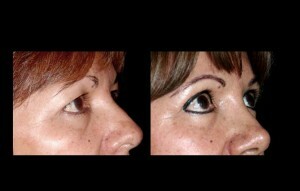 Only in cases where the neck is flaccid and included in the problem, we need to do a full surgical lifting. 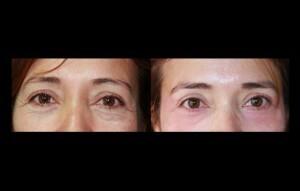 In these patients, the skin is lifted to position the muscles and tissues that have started to hang with age, leaving behind the concept of “stretching” the skin, which used to leave horrible stigmata of surgery. 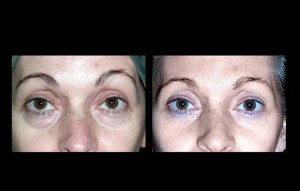 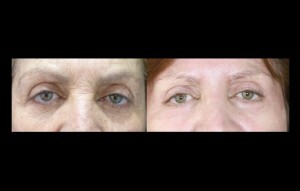 Eyelids have very thin skin which favor the appearance of premature wrinkles and skin hanging. 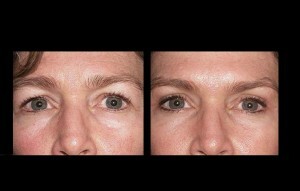 Around 40 years old, and occasionally before that age, these changes start to appear, which increases when arriving at 50 years old. 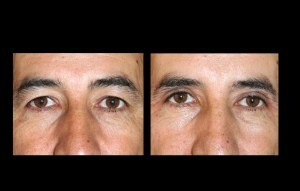 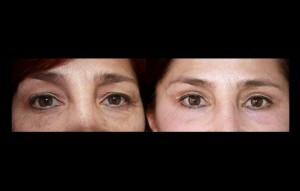 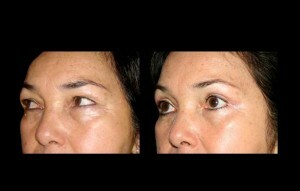 The eye lid surgery or blepharoplasty is a procedure that takes approximately 1 hour. 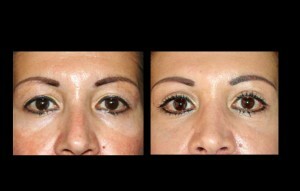 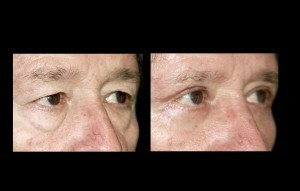 With imperceptible scars, the excess of skin that appears with age is removed from the superior eye lid and the bags formed under the inferior eye lid, that gives a permanent tiresome aspect are corrected, reaching this manner a rejuvenated look, without changing the expression of the eyes. 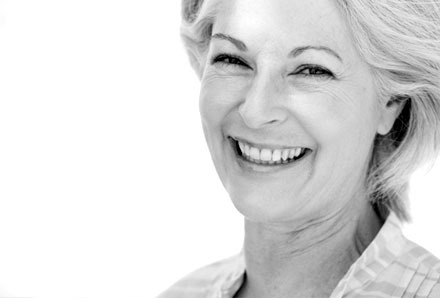 This procedure is performed with local or general anesthesia,and requires a recovery period of 3 to 7 days, which is enough time to go back to work. 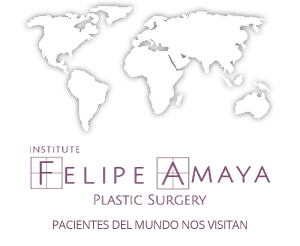 For patient travelling from other cities or abroad, we recommend to stay in Bogota for 1 week, once the stitches have been removed. 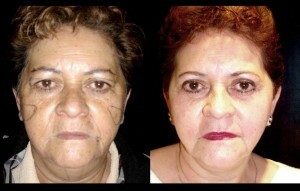 You need to arrive to Bogota 2 days prior to the procedure, for proper preparation. 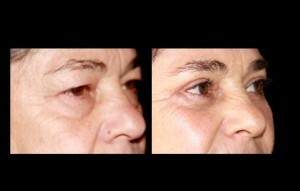 The nose and ears are structures that continue growing during all your life, producing a clear aging stigma. 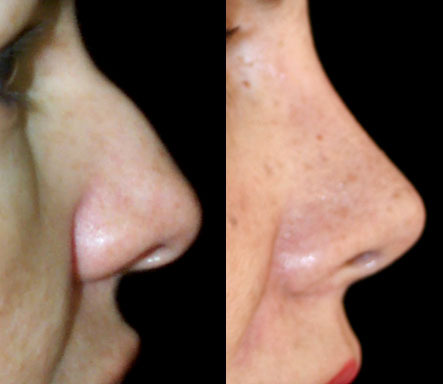 The size of the nose augments, the tip tends to fall, and the skin suffers changes of texture and thickening of the tissues. 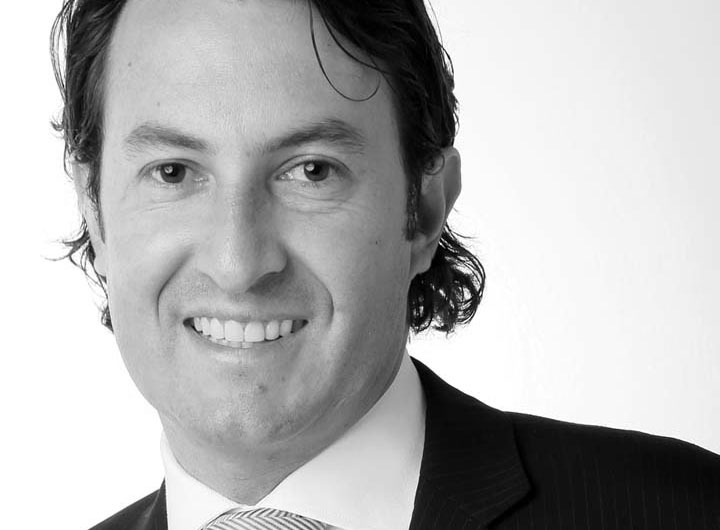 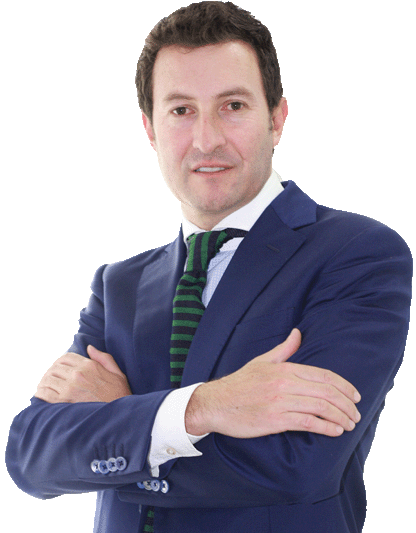 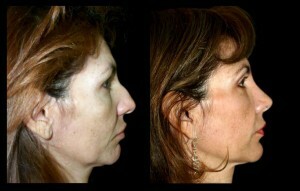 The nose surgery is one of Dr. Amaya’s passion. 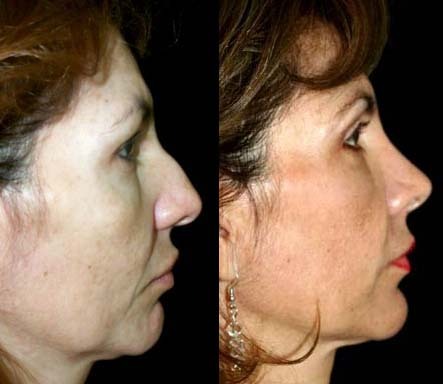 It is an easy surgery that usually does not take more than 1 hour and produces significant rejuvenation with natural results. 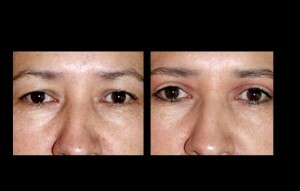 The recovery takes 1 week and patients go back to work with minimum inflammation/swelling. 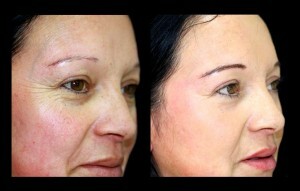 Micro fat grafts are a current trend, not only to correct face grooves, but to recover the volume lost with age. 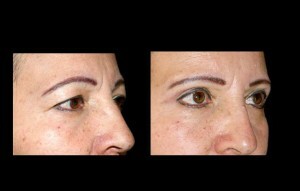 The technique consists of obtaining fat from the patient, generally from the abdomen, to then infiltrate it in grooves and areas that have lost volume with age and obtaining, this way, a better integration and duration of the results. 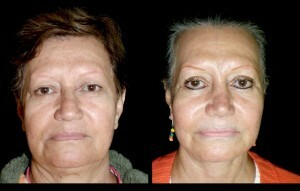 Changes reached are natural and definitive. 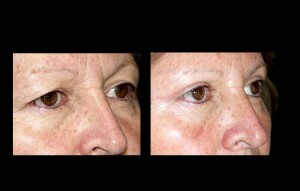 We also associate the new generation of plasma rich in platelet (PRP known as Fat Emulsification Rich in Stem Cells (FERSC)), which consists of the depuration of these cells via double filtering, obtaining a liquid that is injected under the skin of the face to benefit and use the repairing potential of pluri-potential stem cells that recuperate the texture, remove spots and imperfections, and returns the young aspect of the skin. 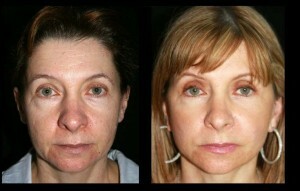 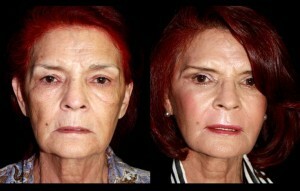 A rhinoplasty was performed by Dr. Amaya to this 54-year old patient, which rejuvenated her face. 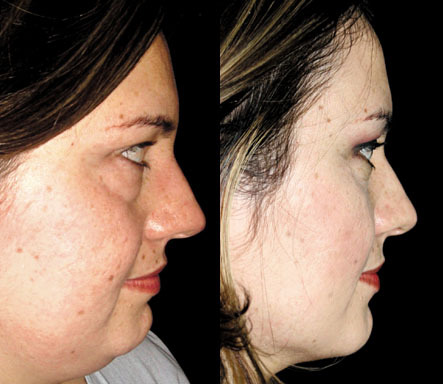 She received micro fat grafts, which improved the loss of volume and Fat Emulsification Rich in Stem Cells (FERSC) that gave her brightness and skin quality back to her face. 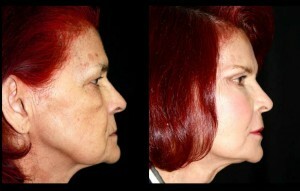 Diminishing the double chin is very simple. 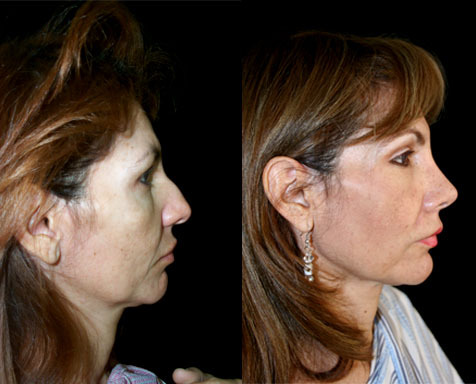 This procedure is performed in only 30 minutes, with local or general anesthesia, depending on the preference of the patient. 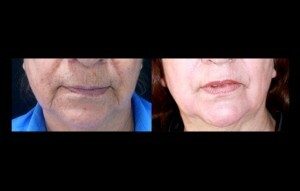 With an assisted liposuction by ultrasound, we remove fat, improving the definition and guaranteeing that the skin smooths. 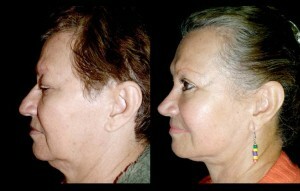 This is contra-indicated for individuals with flaccid or “hanging neck” because the runoff may increase.